While war is raging in neighboring Syria and Iraq, in Lebanon the hot issue is the upcoming dialogue talks between Hezbollah and Future Movement that are expected to lead to peace between the Shiites and the Sunnis in Lebanon. Almost all the Lebanese politicians from the two rival camps ( M8 and M14) have welcomed the anticipated talks with the exception of FPM leader MP Michel Aoun who said that he has nothing to do with them. Speaker Nabih Berri is reportedly waiting for agenda of the proposed dialogue from both Hezbollah and the Future Movement to set a final date for the talks. Nader Hariri, the chief of staff of former Prime Minister Saad Hariri has reportedly returned to Beirut Monday from Paris with the aim of representing the Future Movement in the talks . 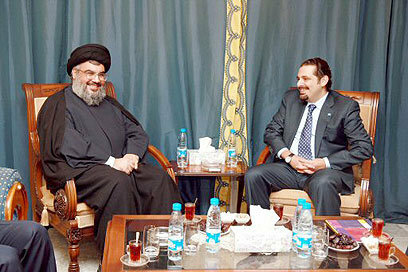 He was in Paris for consultations with Hariri on the topics to be discussed with Hezbollah. In addition to Nader Hariri , the Future Movement will be represented by MP Jamal Jarrah in the dialogue talks , while Hezbollah will be represented by Hussein Khalil, a political aide to Hezbollah chief Hassan Nasrallah and a party MP , who was not identified but according to speculation it may be MP Hassan Fadlallah. The media in Lebanon is reporting that the first round of talks between the Future Movement and Hezbollah is expected to be held in the middle of this month at Berri’s residence in Ain al-Tineh. Relations between the Future Movement and Hezbollah have been strained ever since it was discovered that members of the party were behind the assassination of Hariri’s father , former PM Rafik Hariri. The relations were further agitated by the Shiite party’s rejection of the Special Tribunal for Lebanon, which is investigating the 2005 assassination of Hariri and its military intervention in Syria . Even though they are the main key divisive factors , they may not be on the agenda of the talks according to media reports. Hariri said in a TV interview last week that he was ready for a serious dialogue with Hezbollah with the aim of defusing Sunni-Shiite tensions. He also said he was ready to discuss the presidency issue with Hezbollah. Reaction to the proposed dialogue talks has been positive. Prime Minister Tammam Salam expressed hope that the Future-Hezbollah talks would be in Lebanon’s interest. “Dialogue is useful for Lebanon,” Salam said on Monday. “Everyone acknowledges that problems can be solved through dialogue, which is essential among the political parties because the absence of dialogue leads to many problems. “It is certain that the dialogue will include in-depth discussion on the issue of the presidential and parliamentary elections and matters that can bring Lebanon back to the right path toward further security.” he added. The phalange Party also welcomed the planned Future-Hezbollah talks, saying an inter-Lebanese dialogue would nullify the need to search for a regional or external agreement to break the presidential deadlock. Similarly the Lebanese Forces leader Samir Geagea welcomed the idea of the talks. Geagea told As-Safir, “In principle, I support any dialogue, especially between Sunnis and Shiites in Lebanon, given the volatile situation in the region, which makes any connection between the Future Movement and Hezbollah a necessity, so as to ease sectarian tension. However, I have come to understand that the essential issues that are related to our national security and state management in Lebanon will not be a subject of dialogue now. This is a real weakness, as the real challenge lies in approaching deep problems that are at the basis of the deep domestic rift.” This is in reference to Hezbollah’s role in the Syrian civil war. Future MP Ammar Houri sounded optimistic about the dialogue between his party and Hezbollah, and revealed that the two sides are preparing their proposals for the agenda. Hezbollah MP Ali Fayyad also sounded optimistic . “We have to move on in a positive way toward the expected dialogue between the Future Movement and Hezbollah,” Fayyad said. Saudi Arabia has also blessed the idea of the talks . We are looking forward to a constructive and positive dialogue between Future Movement and Hezbollah and hopes the talks would eventually include all other Lebanese factions, Saudi Ambassador to Lebanon, Ali Awad Asiri said in comments published Thursday. “National coexistence is in itself a provision for dialogue among Lebanese, a constructive one with concrete results that would suit Lebanon and the Lebanese,” Asiri said in an interview with Kuwaiti daily al-Anbaa. But Aoun said the long-awaited dialogue between the leaders of Hezbollah and the Future Movement was of no concern to him. “I’m not interested in the dialogue between the Future Movement and Hezbollah as long as I’m not invited,” Aoun said in remarks published Thursday by Al-Akhbar daily which is closely associated with Hezbollah and the Syrian regime. “I will watch and observe,” Aoun said of the dialogue. Aoun dismissed the idea that the presidential election or a new electoral law will be discussed in the dialogue talks . The FPM chief is reportedly confident that Nasrallah would not end his support for him as the March 8 alliance’s candidate for the presidency. But one could imagine not always … it surely only needs the correct ‘starter poetry’. Like you , I feel sorry for Aoun. and this dialogue is intended to rule him out as a president . Michou, michou, michou ya michou. You poor little toad maybe it’s time for you to wake up and smell the coffee at Geagea’s joint. Don’t let pride stop you, be a big girl and head over there I’m sure he will be glad to let you in and offer you a shoulder to cry on.